The Sun enters Aquarius, and a New Moon occurs very early in the sign today. We’re looking forward, but with Mercury turning retrograde tomorrow, our attention is also called to the past. The Moon is in Capricorn until 7:59 AM EST. The Moon is void from 4:43 AM to 7:59 AM EST. 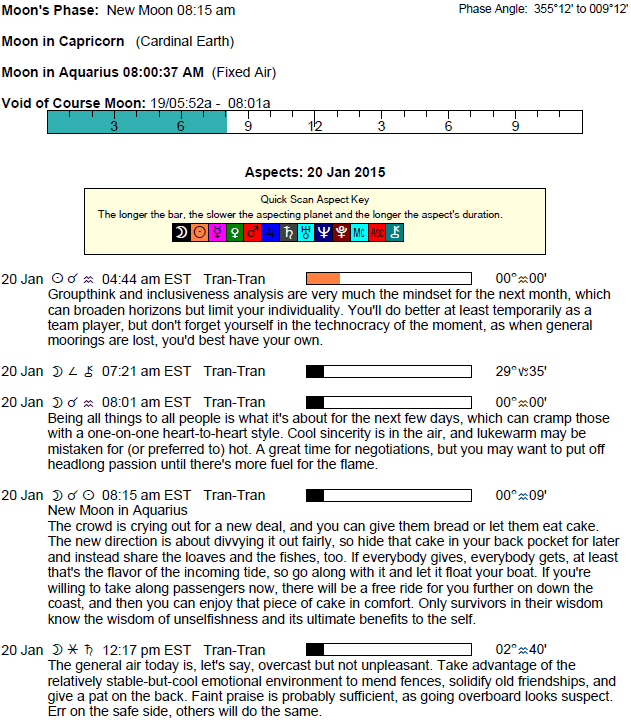 The Moon is in Aquarius from 7:59 AM EST forward (until Thursday, January 22nd at 7:47 AM). A New Moon occurs in Aquarius at 8:13 AM. The Moon is in its Waning Crescent/Balsamic phase until 8:13 AM / the Moon is in its New phase after 8:13 AM. 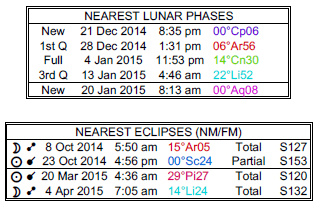 The Moon is waning until 8:13 AM, and waxing after this time. Mercury is moving towards a retrograde station, turning retrograde tomorrow. The Sun begins its transit of your solar eleventh house and will continue to influence this area of your chart until February 18th, dear Aries. You are less concerned with career or life-plan goals now, and increasingly interested in what makes you happy, and what you are contributing to others. You may be networking and socializing more than usual, or you could be asked to join an association or team. You can be more actively participating and contributing, and can benefit from team work. You are entertaining more progressive ideas these days, and people are looking upon you quite favorably. A New Moon also occurs today, bringing with it take-charge energy which you can put into your friendships, involvements with groups or teams, as well as inspiration for new ideas and goals to work towards. Your sense of community is strong, and emotional satisfaction can come through your interactions with, or support of, friends and associates. The Sun begins its transit of your solar tenth house today, dear Taurus, and will continue to influence this area of your chart until February 18th. The spotlight is on you and what you can do, and this can be on a small or large scale, depending on your current life circumstances, but either way, you are more noticeable and accountable than usual during this cycle. You could assume more responsibilities. You can come to a high point of the year in your career or reputation. People in positions of power are more likely to notice you and listen to you during this cycle. Pride can help your reputation, but too much of it, of course, can be damaging now. A New Moon also occurs, giving you a blast of personal energy for pursuing professional goals and for taking charge of your career. You’re clearer about putting something behind you in order to move forward, but with Mercury turning retrograde tomorrow in the same sector, you’re likely to be looking to the past for answers. The Sun begins its transit of your solar ninth house today, and will continue to influence this area of your chart until February 18th, dear Gemini. It’s an excellent cycle in which to lift yourself above your usual routines, even in little ways, in order to consider the bigger picture. You are more adventurous, curious, and spontaneous. You might do more studying, learning, and venturing out and about. Your moral convictions can be in focus and stronger now, and you are more inclined to philosophize and share your opinions and ideas with others. Your aspirations and ideals are stronger driving forces in your life, and you are seeking to feed your spirit. A New Moon quickly occurs in the same sign/sector, providing you with take-charge energy for setting plans into motion for new experiences, adventures, and a stronger understanding of your life’s purpose. Routines are good for you, but you are now encouraged to step outside of the usual routine from time to time to feed your spirit for life experience. With Mercury turning retrograde tomorrow, however, there may be some review required before moving forward. The Sun begins its transit of your solar eighth house today, and will continue to influence this area of your chart until February 18th, dear Cancer. This is a time of year when you can go through some form of self-transformation. You may get rid of something, such as a bad habit or attitude, so that you gain more personal power and a stronger sense of personal accomplishment. Changes, both inner and outer, tend to occur now that remind you that you’re growing, not stagnating. There can be increased focus on intimate connections and sharing, and for some of you, financial or emotional support are important topics in your life now. A New Moon occurs today, adding more punch to all of these things, and stirring up stronger desires. Aim to achieve more creative relating patterns with others, rather than focusing only on what’s missing. This can be a good time to take charge of your finances, and if you need some support, you’ll find that people are more willing to offer it. The Sun begins its transit of your solar seventh house today, and will continue to influence this area of your chart until February 18th. It’s a more social time of the year, and there can be a spotlight on close friendships and partnerships. You can learn a lot about yourself and your life through others now, as they can provide a mirror to certain aspects of yourself that you haven’t been clearly seeing – until now, that is. This is a time when compromise and negotiation tend to serve you best. A New Moon also occurs in this same area of your chart (opposite your sign). A door opens for change in a close relationship. A fresh start in a partnership, or with someone new, can figure strongly in the coming weeks. This is a great time for improving your ability to negotiate with, or simply relate to, others on a one-to-one basis. The Sun begins its transit of your solar sixth house and will continue to influence this area of your chart until February 18th, dear Virgo. Health and fitness goals can come into strong focus now and in the coming weeks, and so can work and daily routines. You become more and more aware of the importance of schedules, routines, and organization in your life, and can be highly motivated to make improvements to these things. Work can be part of all of this. A New Moon occurring today helps you to move these things forward. You have a take-charge attitude when it comes to taking better care of yourself, and for organizing and primping your daily routines. Improved daily routines helps you in many areas of life. There can be job offers in the coming weeks, or you could have new priorities and tasks to manage. The Sun enters the sector of your chart that rules your individuality and creative expression, where it will transit until February 18th, dear Libra. Mercury and Venus are already here in this “show and tell” house, and it’s a time for expressing your talents, abilities, and affections. A stronger urge is with you now to create, put talents to use, show others what you can do, experience and enjoy romance, and enjoy life’s many pleasures. You are less cautious with your heart, and more spontaneous in your actions during this pleasing cycle. A New Moon occurs today and brings even more strength to make changes and start fresh in these areas. It opens doors for you on romantic and creative fronts in the coming weeks. This is a time for starting new hobbies, finding new avenues for entertainment and creative expression, and, for some of you, romantic relationships. It’s time to inject more fun into your life. Try to follow your heart more often, and a schedule or the crowd, less often. This is not the time to hide your light. Today, the Sun is at the lowest point of your solar chart – the beginning of the fourth house. As it moves through the fourth house until February 18th, dear Scorpio, strong reminders of your roots, foundation, and closest ties emerge. This is a time for bringing healing and wholeness, as well as some refinement and organization, to your home life and family relationships. It’s also a time for getting into close touch with what’s in your heart and for anchoring and nesting on a psychological level. It’s certainly not the most adventurous or outgoing cycle in the Sun’s journey through your chart, but it’s important for a sense of identity, comfort, and self-knowledge. A New Moon gives more power to move forward in these areas. Domestic matters have been assuming more and more importance in your life since Mercury and Venus entered Aquarius earlier this month. With the New Moon and the Sun here, you now have the energy and motivation to take charge. This is a strong time for making long-term, future-securing plans, renovations or reorganizing in the home, and family activities. The Sun begins its transit of your solar third house today, dear Sagittarius, and it’s a month-long cycle for increased awareness of what needs to be repaired, healed, and improved in your personal environment, communications, and interactions with others. You may be looking to subjects of study or topics of interest as ways to expand your knowledge, but also as a means to define yourself more completely. You are more curious than usual, and inclined to reach out and make contact with others. You could often find yourself in the position of go-between during this cycle that lasts until February 18th. It’s not the best time for deep, concentrated study or focus, but it’s strong for putting your feelers out, learning new things, and connecting with people and information that help round out your life. A New Moon occurring today quickly gives power to these things. The coming weeks are strong for new writing projects, friendships, courses, transportation opportunities, and relationships with siblings and neighbors. For some of you, there could be breakdown in transportation or communications that bring about the need to do things differently. The Sun finishes its yearly, month-long transit of your sign today, dear Capricorn, and now begins its transit of your solar second house, where it will stay until February 18th. This is a wonderfully grounding period, and you can make the most of it by increasing activities that remind you of the importance and beauty of the “here and now”. It’s also a time for making the most of your natural talents and abilities – for building and developing these things. Taking charge of your personal finances and extra care of your valuables can also benefit you greatly now. A New Moon occurring this morning gives more power to these things, and fuels your enthusiasm and drive to take charge of personal matters of security. This includes finances and other areas of life that help you to feel stable, supported, and secure. Some of you could be looking to make more money, but this cycle is more about getting into a position of control. Opportunities to better your business or to get yourself back on a more productive schedule should be taken now and in the coming weeks, but with Mercury turning retrograde in this same sector tomorrow, some review is also appropriate before moving forward with new plans. The Sun enters your sign today, dear Aquarius, and will continue to do so until February 18th. This is a time when you are at your most resourceful, noticeable, and effective. If you’ve been wanting to make changes to the image you project, then this is a great time for doing so. You have more impact and personal presence during this cycle. You are in charge of your destiny, and while this is the case throughout your life, when the Sun transits your sign as it is doing now, you feel more in charge and can effect change more easily as a result. Make the most of this time with a positive attitude, as this is the start of a new solar year. A New Moon in your sign today gives you more power and a strong sense of a new beginning. With this lunation, you receive a blast of energy that you can harness to bring about needed changes in your life, and especially in your personality, manner, appearance, and image. Something may need to go in order for you to move forward with less baggage and more confidence. The Sun begins its transit of your solar twelfth house and will continue to influence this area of your chart until February 18th, dear Pisces. You quite readily help out others, and this trait is emphasized now. This is the beginning of a cycle of rest and reflection. You are gathering your strength for busier times to come, but also reflecting upon recent events and shedding attitudes and situations that have run their natural course. Projects, and possibly even a relationship, might be put behind you if it’s no longer supportive. You can take extra time to make decisions mainly because it’s necessary to come into deeper touch with what you need and want before you can push ahead with confidence. This can be a time of connecting with your more spiritual side, but for some, there can be a feeling of being a little lost temporarily. A New Moon also occurs today, bringing powerful feelings and intuition to the surface, and take-charge energy for dealing with matters of the past. *Remember to read horoscopes for the sign of your Ascendant and your Sun sign. You have difficulty coping with the realities of every day life. Practical daily chores seem beyond your capabilities, and you have difficulty concentrating on matters at hand. You are objective and philosophical, preferring to view life from an intellectual perspective. Your rational mind will outweigh your feelings every time, as you consider the world of emotions to be irrational. You have a high sense of fairness, and a logical thought process. Your weakness lies in the fact that you view emotions in a disparaging light. You prefer to follow in other people’s footsteps rather than initiate actions. You can be relied on to come up with the goods as long as someone else has the initial ideas. Your survival mechanisms are weak. You do not enjoy change. You expect others to be reliable, like yourself. We are impulsive, always looking for new opportunities to express our ideas. We react from our own subjective viewpoints. We enjoy starting new projects. 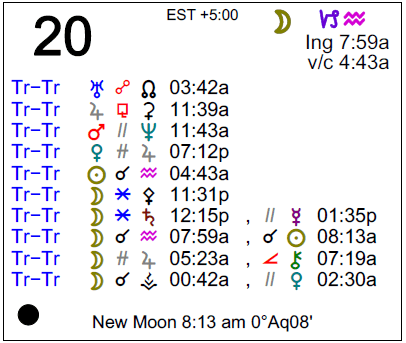 This aspects indicates a New Moon at your birth. This life will include a new beginning in at least one area. How you see yourself and feel about yourself are one and this can make you self centred, sometimes even narrow minded. You can lack objectivity and perspective. You will have the chance to take on responsibilities and prove yourself successful. You express yourself in a loving manner. You enjoy talking with people, and they find you a warm and welcoming listener. You are prone to making mountains out of molehills. You struggle to keep a balanced viewpoint, but can become fanatical in pursuit of your beliefs. You feel a contradiction inside you between wanting to push yourself forward and a part which holds you back. You will spend a lot of time developing a controlled energy level and because of this you can eventually achieve great success. Your enthusiasm can lack boundaries and you need to learn self discipline. You need to avoid addictive behaviour and would be better to avoid alcohol or drugs. You need to be able to escape into art, or water. Use your energy to create or to enjoy pursuits such as water sports. Your personal desires always seem to be thwarted. As a small child, you may have experienced difficulty in getting your own way in your own home. Later, as an adult, it may have seemed that the world was conspiring against you. Your lesson is to focus on the needs of the world, rather than personal desires. Once this concept is learnt, you will be a powerful advocate for humanity. You will be able to empathise with and fight for those who need your strength and compassion. Sabian Symbol: A bomb that failed to explode is now safely concealed. 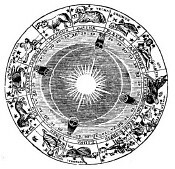 Sun 00° Taurus 04' 44"
Moon 13° Scorpio 10' 50"
Mercury 04° Aries 04' 52"
Venus 29° Pisces 43' 56"
Mars 13° Gemini 17' 53"